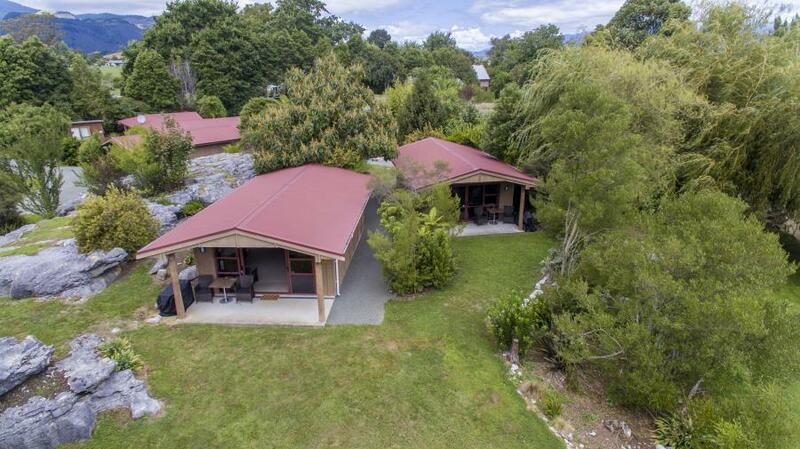 Situated on the edge of Takaka township, a short 10 minute stroll to the centre of town. The Rocks Chalets offers 5 private individual motel style open plan self-contained ensuite Chalets - Pukeko, Fantail, Kiwi, Kereru and Tui, set in a peaceful location amongst scenic karst rock formations. A wonderful base to explore the attractions that Golden Bay has to offer. We are looking forward to greeting you upon your arrival at The Rocks Chalets, Takaka, Golden Bay at the top of New Zealand's South Island. Individual large open plan queen bed suite with en suite and private patio set amongst scenic karst rock formations. Please note this Chalet has its own enclosed courtyard so has no garden view. All chalets have a fold out sofa bed, tv/dvd player, kitchenette and an outside BBQ. A communal Washing Machine and Dryer is available onsite. Our chalets are designed for couples but can sleep four comfortably remembering they are open plan. If required single beds are available on request. Please let us know if more than 2 guests and additional bedding is required so we can accommodate your needs. Individual north facing large open plan queen bed suite with en suite and private patio set amongst scenic karst rock formations. If you are looking for two rooms close together then Chalet 2, Fantail and Chalet 3, Kiwi are ideal. All chalets have a fold out sofa bed, tv/dvd player, kitchenette and an outside BBQ. A communal Washing Machine and Dryer is available onsite. Our chalets are designed for couples but can sleep four comfortably remembering they are open plan. If required single beds are available on request. Please let us know if more than 2 guests and additional bedding is required so we can accommodate your needs. Individual large open plan king bed suite with en suite, private patio and private deck set amongst scenic karst rock formations. All chalets have a fold out sofa bed, tv/dvd player, kitchenette and an outside BBQ. A communal Washing Machine and Dryer is available onsite. Our chalets are designed for couples but can sleep four comfortably remembering they are open plan. If required single beds are available on request. Please let us know if more than 2 guests and additional bedding is required so we can accommodate your needs. Individual north facing private patio bath chalet, large open plan king bed suite with en suite and your own private patio bath, enjoy bathing under the stars, set in its own scenic karst rock courtyard. All chalets have a fold out sofa bed, tv/dvd player, kitchenette and an outside BBQ. A communal Washing Machine and Dryer is available onsite. Our chalets are designed for couples but can sleep four comfortably remembering they are open plan. If required single beds are available on request. Please let us know if more than 2 guests and additional bedding is required so we can accommodate your needs. Whatever you enjoy doing you'll find something to interest you in Golden Bay. The Te Waikoropupu Springs are located in Golden Bay, on New Zealand's South Island. The springs are known for the clarity of the water, and the volume of water discharged. Experience the thrill of catching your own food. Come find a magical spot on Lake Anatoki to cast your line and land your lunch. The ultimate in geological eye-candy around these parts are the phytokarst features of Rawhiti Cave, a 15-minute drive from Takaka. The Saturday Takaka Village Market is a small colourful and mainly but not exclusively local open air market that happens rain or shine. It is a highly social mingling of locals and visitors who come to browse and buy.